First, however, some historical perspective. These three airports, like most in Canada, were built and maintained by the Federal government. That is, tax dollars built and maintained them. In the 1990s, a process began whereby responsibility for these airports was transferred from the Federal government to local, not-for-profit corporations. These new airport authorities lease the airport facilities from the government and are responsible for operating costs and any future capital expenditures. Clauses in at least some of these lease agreements delay the start of lease payments – for example, the Fredericton airport authority does not begin paying the ‘rent’ to the Federal government until 2016. Airport authorities generate revenue by charging fees to airlines using the airports (terminal fees for landing and departure costs) and may also charge passengers additional fees (airport improvement fees). This gives airports incentives to compete with each other for passengers and flight traffic. In Fredericton’s case, over 30% of revenues in 2014 came from passenger facility fees. Here are some data for Moncton’s airport from Statistics Canada’s Cansim Table 401-0044. By way of explanation, in the Table below ‘enplaned’ means passengers departing per year, and ‘deplaned’ means passengers arriving per year. ‘Domestic’ means passengers flying within Canada, ‘Transborder’ means folks flying to or from the US, and ‘Other International’ means people flying to or returning from non-US international destinations (I presume, in Moncton’s case, these are mainly passengers on charter flights). Why Moncton? Well, for the most part, Moncton is the only airport in NB where the data are available in this detail. For Fredericton and Saint John, data supplied in Table 401-0044 are for number of passenger flights only (2010-2014). Note that the total passenger number is the total of those arriving and departing. When airports present passenger data in their Annual Reports they use that total. A layman might think that that total represents the number of unique individuals using the airport per year. In fact, the number of round-trip passengers using the airport per year is about half of the passenger total. That’s because most users fly out of, then return to, the same airport. Each round-trip user is counted twice, and those folks make up most of the ‘total passenger’ number. In Moncton’s case, that means the number of round-trip passengers using the airport for travel purposes was about 325 thousand in 2014. That is equivalent to about 890 round-trip users per day for 365 days (or about 1780 ‘total passengers’ per day). Data on passenger numbers per year for Fredericton and Saint John are not available from Statistics Canada. Instead data were taken from the Annual Reports produced by the respective airport authority – unfortunately those are not broken down into arriving/departing data, by destination or by scheduled/charter subcategories. I’ve also included numbers for Moncton from their annual reports, for an apples-to-apples comparison. You will note that the numbers below for Moncton differ somewhat from those provided by Statistics Canada. Data are taken from the Annual Reports released by each airport authority. Previously, I showed my calculations for Moncton’s passenger load per day, so, for comparison’s sake, the number of round-trip users (and ‘total passengers’) for the Fredericton and Saint John airports for 2014 would be approximately 434 (868) and 340 (681) persons per day, respectively. Makes the passenger loads borne by the terminals look a bit different doesn’t it? There actually are not that many people using the airports on a daily basis. Yes, the terminals can get a bit crowded sometimes, but that is more of a scheduling issue rather than a passenger load issue, per se. It’s not clear how those brief busy periods translate into a need for expanded terminals. A related dataset ( Cansim Table 401-0045 ) supplies some air cargo data – during the period 2010-2014, Moncton had over 5,000 cargo flights per year whereas Fredericton and Saint John had about 900 cargo flights each per year. First, here are some additional data from Statistics Canada (Cansim) Table 401-0044 showing total number of passenger flights per year for 2010-2014. Note that, up to 2014 at least, the three airports have yet to equal flight totals from 2011. If we divide the annual flight numbers for 2014 by 365, we get an average number of flights per day (total of arrivals and departures): Fredericton = 23; Moncton = 33 ; Saint John = 19. Based on information from the YQM website (July 2015) , the Moncton airport has about 16 scheduled passenger departure flights per day (I would estimate about 14 cargo flights per day, based on Table 401-0045). Fredericton and Saint John average about 11-13 scheduled passenger departure flights per day (again based on departure information from their respective websites – July 2015), plus about 2-3 cargo flights per day. These numbers do not include charter flight departures, or other departures. All airports are promising more scheduled flights and/or more airlines in the future, but it isn’t clear that this by itself will increase passenger totals. It might simply spread the load out over more flights, or lower ticket costs. Airports also handle charter flights but those data do not seem to be available to the general public (although they apparently are included in the passenger totals published by the airports in their annual reports). Total passenger traffic at the three airports has grown over the years. That is affected by a number of factors including economic growth, population growth, disposable income, and available flights. Another factor is the relative strength or weakness of the Canadian dollar versus the U.S. dollar. When the CDN dollar is near parity with the US dollar, flights out of Bangor and Portland ME look attractive; when the CDN dollar is at 0.75 per US dollar, flights from those cities might look less attractive and New Brunswickers might be more inclined to fly out of local airports. I’d guess that probably affects Fredericton and Saint John more than Moncton. Given recent declines in the value of the CDN dollar vs the US dollar, Fredericton might expect a boost to passenger traffic in 2015 as the gap in prices between Bangor/Portland and Fredericton narrows. 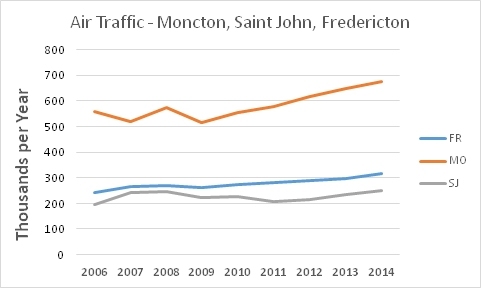 In any event, it is clear that, over the past few years at least, passenger growth at Moncton (YQM) has grown faster than at Fredericton (YFC) or Saint John (YSJ). Over the past six years, Moncton has seen an average growth in total passengers of about 5% per year, compared to about 3% and 2% for Fredericton and Saint John, respectively. Globally, growth in passenger air traffic of about 5% per year seems to be the norm. It would appear that Moncton has a much stronger case for Federal and Provincial investment in airport infrastructure – especially if the goal of that spending is to grow passenger/flight numbers. They now have the greatest number of scheduled flights per day and, in recent years, the greatest growth in passenger numbers. Given those passenger numbers (roughly double the total passenger numbers for Fredericton or Saint John), they would also be the most likely airport to see both more airlines and direct flights to additional locations in the U.S. and Canada. I’d also note that the growth in Moncton passenger traffic comes despite the ‘nearby’ presence of the Halifax airport (which has passenger numbers much higher than Moncton’s). Passenger growth at Halifax is actually a bit slower than at Moncton. Passenger ‘bleed’ from Moncton to Halifax, if there is any, does not seem to be having much impact on Moncton. Another scenario that has been raised is the construction of a new airport in the Sussex area. That would be a costly undertaking and it is not clear what it would achieve, apart from allowing Fredericton and Saint John to feel a bit better about their status relative to Moncton. Such an airport would have to be near the intersection of Routes 1 and 2, otherwise significant highway construction would be required to service the airport. That location is only 30-40 minutes from YQM. I don’t see the point of such an airport. All three airports will point out that they have significant economic footprints and provide local jobs. That’s true to a point, but I’d note that where you have several schools or hospitals in a region where demand for those education/medical services would suggest some of them could be closed, you will hear the same arguments. That does not (always) stop the rationalization from taking place. If taxpayers or airport users are spending more than they need to in order to have a certain level of service, then perhaps some changes are needed. The airport authority in Fredericton, for example, has made it pretty clear it wants money from the Province, the Feds, and Fredericton to help fund new infrastructure at the airport. This pitch has been made in the local newspaper and there appear to be more frequent ads promoting YFC in the same paper. All three airports have sought government funds to assist in expansion/renovations in the past and no doubt will continue to do so in the future. If they are unable to borrow the needed funds from the private sector (and at least some of these airports do have existing bank loans), then perhaps there is a problem with their business model (for example, excessive infrastructure/costs and too few passengers?). I’d note in passing that a quick review of financial statements for YFC for the years 2010-2014 shows that, while revenue increased by about 24% during that period, expenses grew by about 30%. Within the expense category, salaries and wages grew by over 40%. Although passenger traffic might be growing somewhat, expenses seem to be growing faster than revenue. Is that trend likely to continue? What will happen when, under terms of the lease agreement, the Fredericton authority has to start making lease payments to the Federal government? What will happen if the airport authority gets its wish and infrastructure is increased? Will expenses outpace revenue? Now taxpayer-supported infrastructure projects proposed by airport authorities might very well be justified, but surely we should think a bit about what we need and not just what we want. What do we really need with respect to airports in NB? What can we afford? Is it better to spend Federal and Provincial tax dollars on trying to build up three airports, or should we use those dollars to raise the profile of one (for example, Moncton, since it currently the largest of the three airports) in order to enhance its ability to attract passengers/flights? Would not that be the best way to get more direct flights to more destinations? Would not that be the best way to increase the number of airlines flying into NB? On the other hand, it is not realistic to expect that an ‘enhanced’ Moncton airport would ever offer the number of flight options available at Halifax, which has over five times the passenger traffic. Investing more in, say, Moncton, would not mean ignoring real needs at YFC or YSJ, but it would mean looking at the region’s requirements as a whole rather than just the interests of one small ‘urban centre’. Are we big enough to do that? At the very least, we need to have these discussions, and have them in a public and transparent way. We certainly should be demanding more transparency from the authorities in terms of both flight and passenger data. Media folks could spend some time looking at those data, plus financial data, rather than just accept what the airports are saying. In my opinion, we should also consider moving from three independent airport authorities to one – that should both reduce administrative costs and improve regional planning. This entry was posted in Economy, Governance by Datapoints_NB102. Bookmark the permalink.